For more than 12 years, Horizontal Falls Seaplane Adventures has been a family business, owned and run by a close-knit team of passionate locals. They use our unique insights and understanding of this great land to make your experience unforgettable. They started in 2006 as the first Horizontal Falls tour operators. And are still the largest and the most experienced, with the widest choice of tours. They have also won many awards over the years. Two gold medals at the recent Australian Tourism Awards are among their latest accolades, but their business isn’t just about them, it’s about you; making sure you have the time of your life. They have already welcomed over 150 000 guests and have grown the business into the largest of its kind. Your comfort and safety are their priority and their experienced pilots, skippers and local tour guides make sure you love every second. Horizontal Falls Seaplane Adventures was started in 2006 by Kimberley local, Troy Thomas. He still owns the business and his close-knit team is made up of like-minded locals who share his passion. Troy has always been deeply entrenched in tourism, especially in Western Australia’s remote and spectacular north. 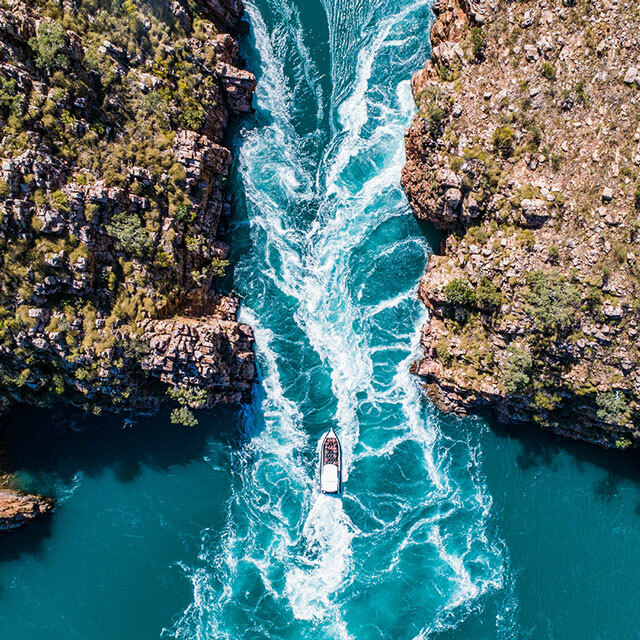 Since opening his own fishing charter in Broome at the age of 18, his focus has been to showcase the magnificence of the Kimberley and Horizontal Falls through unique and exciting tourism ventures. And for the past 12 years, the family-owned Horizontal Falls Seaplane Adventures has done just that, and more. As the region’s most experienced and longest-running Horizontal Falls Tour operators, they know there’s no better way to experience the Kimberley than at close quarters. That’s why they pioneered seaplane tours over this magnificent wilderness. They have our own fleet of Cessna turboprop seaplanes which are meticulously maintained to the most rigorous standards and piloted by highly experienced crew. And because their planes can fly at low level, the views are spectacular. The watery landings and take-offs are pretty special too. Their amphibious planes also land right at the Horizontal Falls where their home base with accommodation and dining facilities is located, providing the ultimate in guest comfort and convenience. They also have their own helicopters to take you even closer to this breathtakingly beautiful landscape. They offer the widest range of day trips and luxury overnight adventure tours to the spectacular Horizontal Falls and the scenic surrounds. Their fleet of seaplanes, helicopters, fast boats, fishing charter vessels and houseboats will provide you with luxurious comfort and unparalleled opportunities to get up close and personal with the breathtakingly beautiful landscape of Western Australia’s remote and unspoilt north. For a thrilling adventure experience of a lifetime, trust their decades of skill, experience and award-winning service at Horizontal Falls Seaplanes Adventures to make your dream come true.